Images may contain extra textual information such as date taken, camera model, shutter speed, and even geolocation. These can be beneficial in most cases but if you want to get rid of them then you will learn that it is not that easy. Fortunately IrfanView can do this with a little command-line so DropIt can be used to remove EXIF in batch. First open the image from which you want to remove Exif data. That’s all. Activate the profile and drag-and-drop images with EXIF data to DropIt, and they will be cleaned. As a side-effect, images will take less space too. 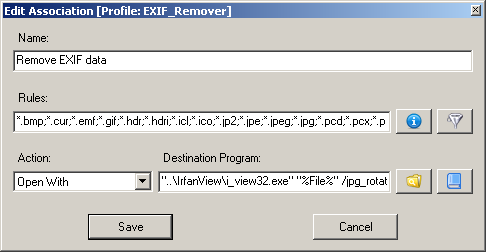 Note that IrfanView overwrites original images with the clean ones, so it is recommended to make backup first.